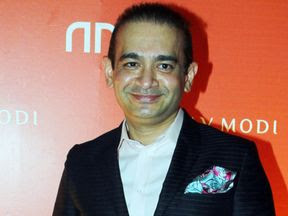 Indian authorities are asking Britain to extradite billionaire jeweller Nirav Modi, who is allegedly at the centre of a £1.3bn bank fraud. Modi and his uncle, Mehul Choski, are accused of illegally diverting loans from India's second largest state-run lender, the Punjab National Bank, to foreign-based companies. Modi, 47, fled India in February and has since been linked to several countries. India's Central Bureau of Investigation (CBI) launched a global manhunt for the tycoon earlier this year. A spokesperson for the bureau told AFP: "We received confirmation from Britain through our Interpol channels that Nirav Modi was seen there." Last February, investigators seized more than half a dozen luxury cars including a Rolls Royce Ghost and a Porsche Panamera from the billionaire and his companies, along with around £625,000 worth of jewellery, gold, diamonds, precious metals and stones. The CBI has also been also in contact with the United States, France, Singapore, Belgium, the United Arab Emirates and Hong Kong. Modi appeared on Forbes' 100 Richest Indians list for several years and also is said to have had several celebrity customers, including actresses Priyanka Chopra, Naomi Watts and Kate Winslet. Before the investigation began, Modi appeared on the Forbes list with an estimated worth of £1.5 billion. He has now been removed. Choksi, a diamond merchant, is believed to be in Antigua. Mr Modi's lawyer and Mr Choksi's firm, Gitanjali Gems, have both previously denied any involvement in what has been called India's biggest ever banking scam.